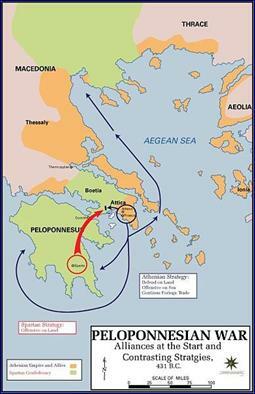 Alliances in the Peloponnesian War, 431 B.C. Credit: Wikimedia Commons. The Athenians, inventers of Western democracy, starved the island into submission, killed the men, and sold every Melian woman and child into slavery. In the greater sweep of the 27-year Peloponnesian War, the incident at Melos was minor. Melos was in the way of rampaging elephants. With subtlety and nuance, however, Thucydidesâ€™ long dialogue records the Melianâ€™s naÃ¯ve bewilderment at the choices presented by the Athenians: slavery or death, small numbers confronting superior strength, neutrality versus cooptation. What the Athenians ultimately said to the Melians was this: might will always make right, the strong will always do what is in their power to do, the weak must ultimately submit, and if you are not with us you must be against us. Swiss Federal Council, 2008. Credit: Wikimedia Commons. The origins of the Swiss approach to domestic and foreign affairs date back 400 years. Before it was a country, Switzerland was a loose federation of cities, states, and cantonments without a central government. The Charter of Wil, concluded in 1647, created a joint defense for the common good and the countryâ€™s first declaration of neutrality. It was a bulwark against the predations and disputes of larger neighbors and, equally important, a way of managing its internal politics in a democratic manner. In contrast, Melos, the small Mediterranean city-state, was a weak pawn pleading the moral high ground of non-alignment in the face of overwhelming and brutal forces. Their eloquent arguments were ignored and they were crushed. Switzerland, with its defensive hedgehog strategy, suggests another approach, more muscular in its impartiality, and one grudgingly respected by others who are in every way bigger and stronger. 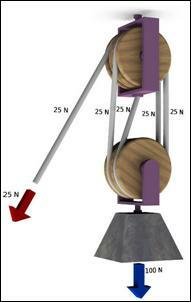 Power is â€œWork Doneâ€� - Energy Transfer in a Pulley. Credit: Wikimedia Commons. In physics, power is a measure of work done or energy transferred. 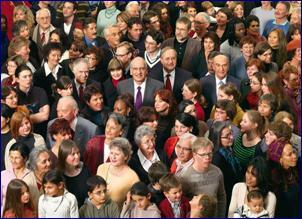 In the political world, it is the ability to impose your will. In both arenas, power is an input, something you use to accomplish bigger things. If people arenâ€™t using it for larger ends, they are squandering it. In the 1960s and 70s, Saul Alinsky, a brilliant Chicago-based community organizer, used to tell his people that power is not just what you have, but what your enemy thinks you have. He was a master of gaining and using leverage. As he demonstrated over and over, power is rarely a blunt instrument. It is a set of diverse paintbrushes: economic power; human capital mobilization power; legal power; expert and information power; bureaucratic power and the ability to gate-keep and control choke points; the power of personality, integrity, tenacity, patience, and charisma; the power of the press and a good story; legal fire power and the ability to compel. You need power but the more demanding questions center on what you plan to do with it.